Digestion, the second stage of the Six Stages of Nutrition, is the process by which complex foods are broken down into simpler substances which the body uses for energy and tissue building. For centuries, master herbalists have known that a calm, relaxed digestive system is essential to optimal wellness and that certain herbs work to calm and relax the digestive tract and support and promote the function of the digestive system. 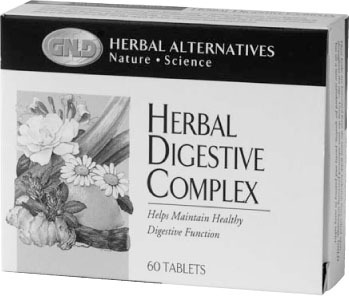 GNLD’s Herbal Digestive Complex is a gentle, yet potent blend of herbs that helps support comfortable and optimal function of the digestive tract. Why Choose Herbs For the Digestive Tract? Because herbs have been shown to help relieve symptoms of mild digestive distress including cramping, flatulence and inflammation. 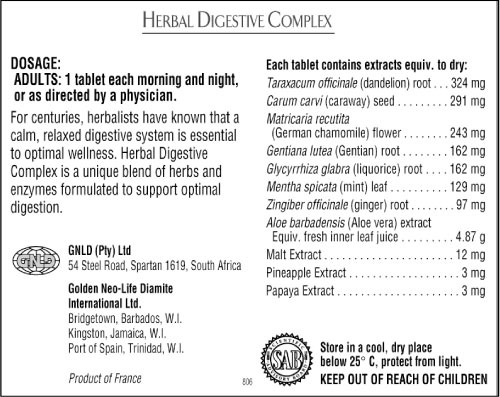 Why GNLD Herbal Digestive Complex? Comprehensive formula. Our unique “complete family” approach to the formula provides broad, synergistic effects of the herbal constituents, which optimize their ability to support digestive wellness. Contains German Chamomile, which has been shown to help improve appetite and digestion, reduce inflammation, relieve flatulence and quiet and relax gastrointestinal spasms. (Taraxacum officinale) Helps support digestive function, lazy bowels, relieves constipation. (Carum carvi) Assists in promoting appetite and digestion, helps relieve flatulence and gastrointestinal spasms. (Matricaria recutita) Promotes appetite and digestion, reduces inflammation, helps relieve flatulence and gastrointestinal spasms. (Gentiana lutea) Helps support digestive function, promotes appetite and digestion. (Glycyrrhiza glabra) Reduces inflammation, assists in soothing gastric mucous membranes, supports liver function. (Mentha spicata) Assists in overcoming flatulence. (Zingiber officinale) Reduces inflammation, assists in overcoming flatulence, promotes the circulatory system. (Aloe barbadensis) Soothes gastric mucous membranes.